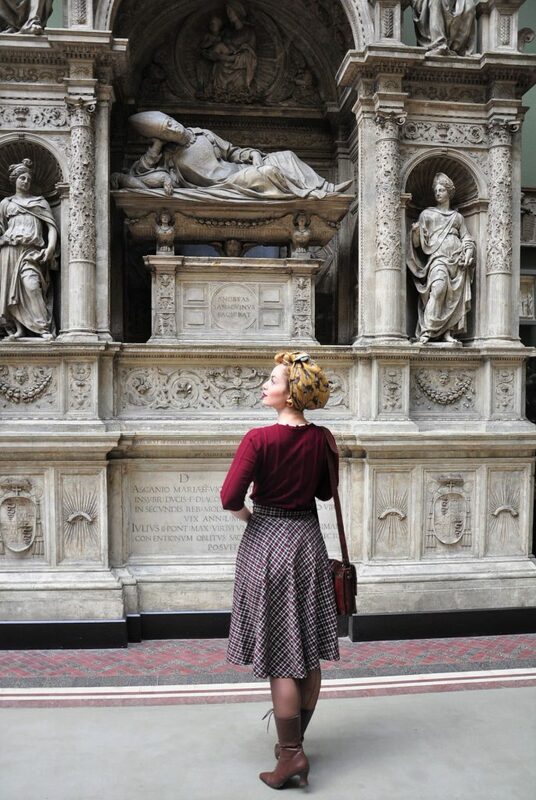 I am taking you to London’s V&A in South Kensington, one of my favourite museums, and have a look at William Morris, the history of the British Empire and giant casts, and a wonderful Topvintage look to complete the day. Die deutsche Version des Beitrags findest du hier: Ein Tag im Victoria & Albert Museum London. Together with Kensington and Chelsea the small district South Kensington is forming the western belt of London’s inner-city. With its up-market properties it is considered to be one of the richest neighbourhoods in London. Its unique architecture and the countless brightly coloured boutiques invite you to stroll through the lively streets and the wonderful parks are great places to take a break in between. In no other district of London is the spirit of Queen Victoria so present as it is here. The architecture is dominated by the Victorian style – named of course after her – which in and of itself makes this place worth a visit. To meet the desire of her prince consort Albert of Saxe-Coburg for a science centre, the district formerly dominated by agriculture started to chance rapidly into one of the most important cultural hubs in the world, starting in 1851. This status has remained with South Kensington throughout the years. 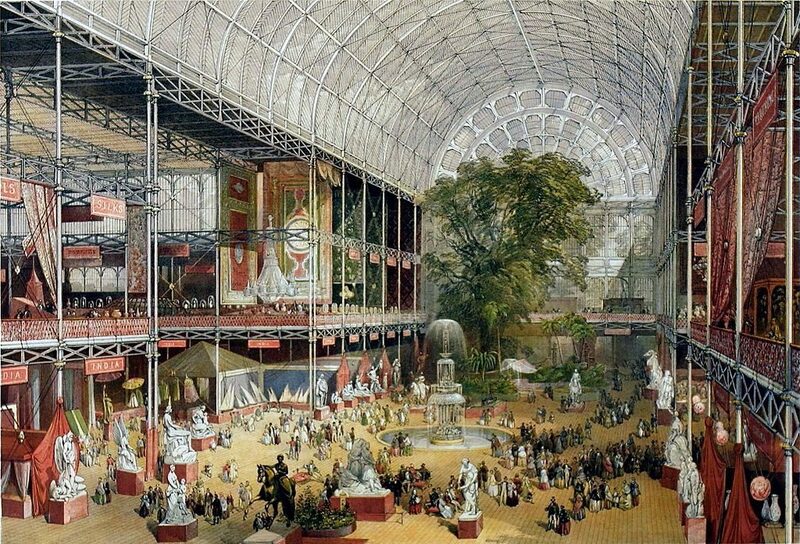 A lithography showing the inside of Crystal Palace during the Great Exhibition. Many countries from all over the world displayed their innovations in arts, design or industry. This was one important step of making Kensington an place of education. Via Wikimedia Commons. In 1851 the Great Exhibition took place in Hyde Park. A 352,000 m² space was dedicated to creating a home for institutions working in arts and sciences. This place is nowadays the Exhibition Road, where museums and universities were founded. On Exhibition Road you will find nowadays the Natural History Museum, Science Museum and the Victoria & Albert Museum all lined up next to each other offering an unprecedented range of exhibitions and events for young and old. Kensington was also an area where famous artists of British history lived, such as author and illustrator Beatrix Potter (1866–1943), or writer Virginia Woolf (1882–1941). 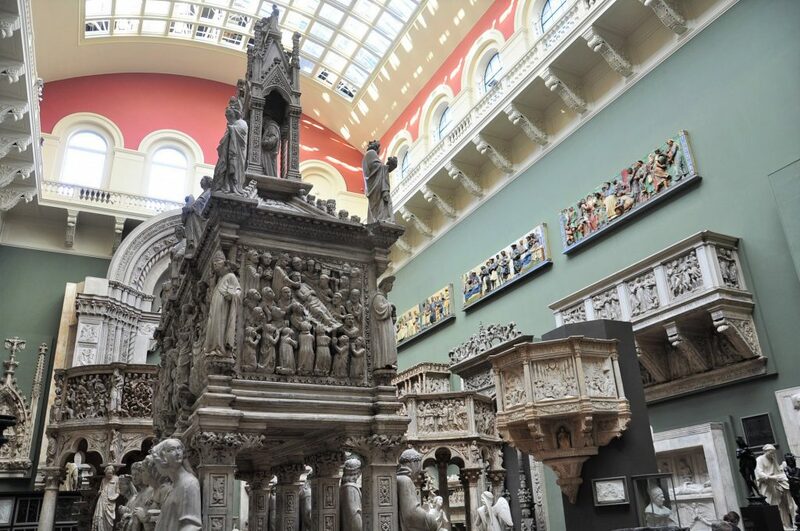 The collection of London’s V&A spans over a thousand years of art. After the enormous success of the Great Exhibition the year before, the Museum itself was established in 1852. The V&A originator, Sir Henry Cole, wanted to make works of art available to everybody. His aim was to educate the working people and to inspire British designers and manufacturers. The open work crown at the main entrance is surmounted by the statue of fame. The Museum moved to its present site in 1857, when it was still called the South Kensington Museum. Thanks to an innovative lighting system it stayed open until 10 pm. 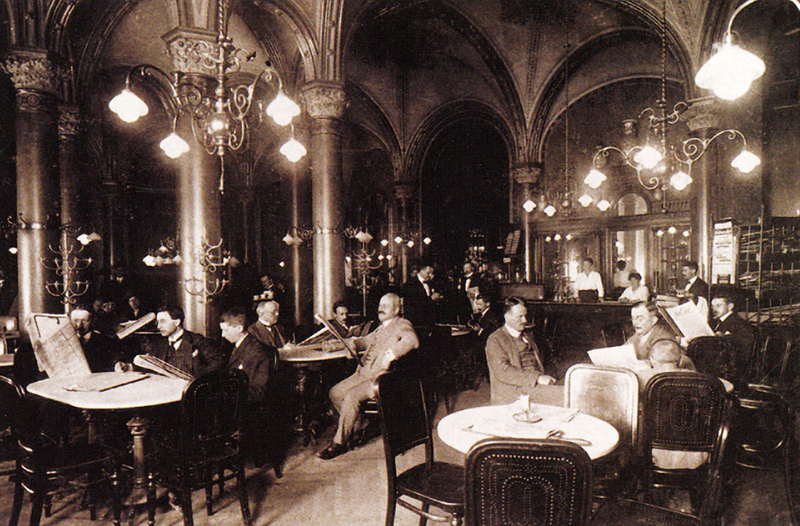 For three nights a week, the working men could visit, while the other days it was opened for higher classes. 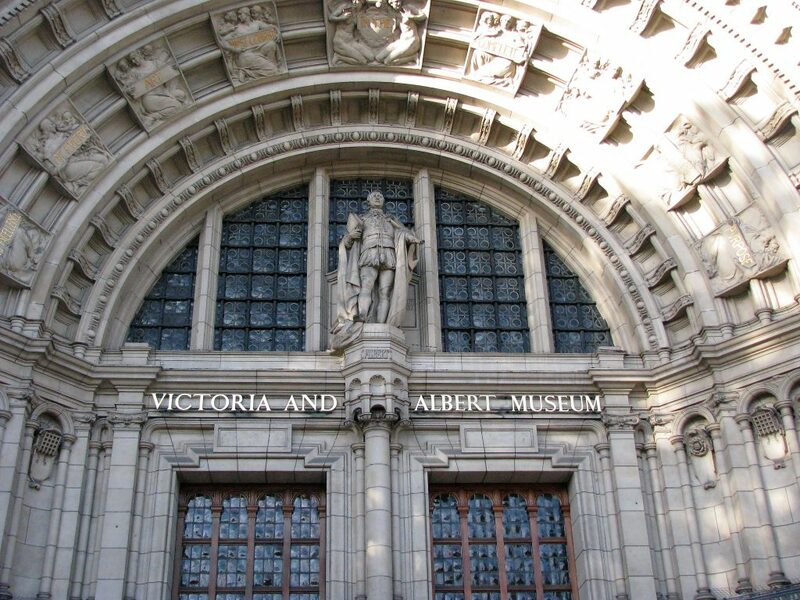 The new façade was built in 1899, when it was also renamed as Victoria and Albert Museum. Strolling through the streets of Kensington. 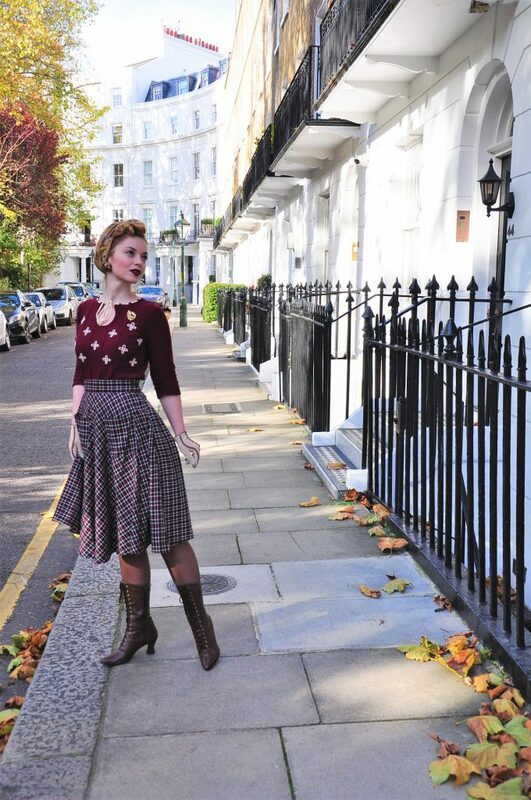 I was kindly given a beautiful 1950s autumn look by Topvintage Boutique and thought this would be a wonderful opportunity to take it out on the road, shoot some pictures with it and enjoy the beautiful city in my new outfit. The one detail I love most about this look is the super soft scarf with a cat print on it. When I received the parcel I was quite surprised how much the kitties on the scarf resemble my Bengals! Have a look at this picture to compare, am I right? The texture is perfect to create turbans, so this is the way I like wearing this piece, which you can buy here. Pattern to pattern – I love the chequered entrance steps of the houses around Kensington! I chose a bordeaux coloured look to match, as this is the colour I feel most self-confident in. The pullover is really comfortable and the little white flowers as well as the bow create a cute neckline. It truly looks and feels like a true vintage, handmade top! I guess this piece will also be one of my favourites the upcoming winter period. You can find it here on the website. And a pretty tartan skirt is a must every autumn and winter! 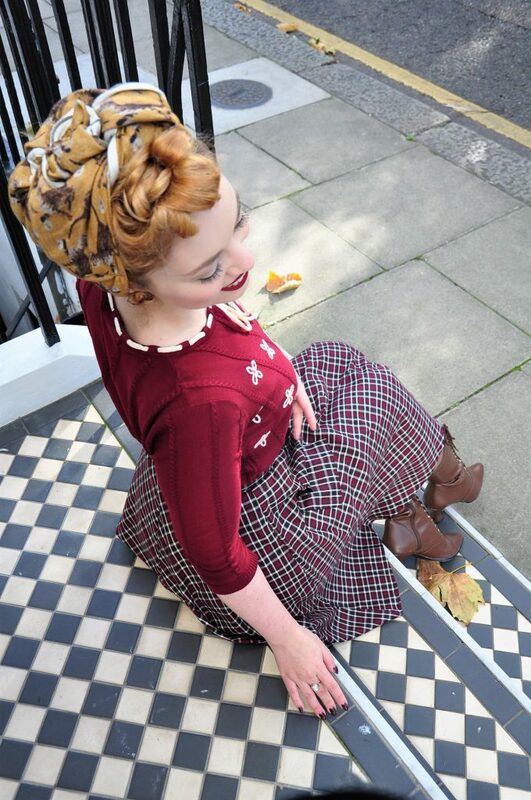 Back to my bordeaux-love – I found this adorable swing skirt to complete the 50s style. Brown boots always go well with this colour, as well as golden accessories like the lovely brooch, which I heired from my partners‘ deceased grandmother. Further details of the look are my favourite stockings – the brown, seamed What Katie Did pieces, which last ultra long and always look beautiful with this colour sceme. Thanks to Topvintage us Germans don’t have to order them in UK anymore! To stay warm in autumn in winter I always wear undergarments from the 40s or 50s, which I buy in second hand or vintage online shops. They are really pretty, some of them even made with lace, and keep the hips and legs warm. To me this is the perfect outfit for a long day in the city, to stay warm as well as to feel beautiful, feminine and comfortable – without always having to check whether the hair is still on fleek or the collar of the blouse is still on point. 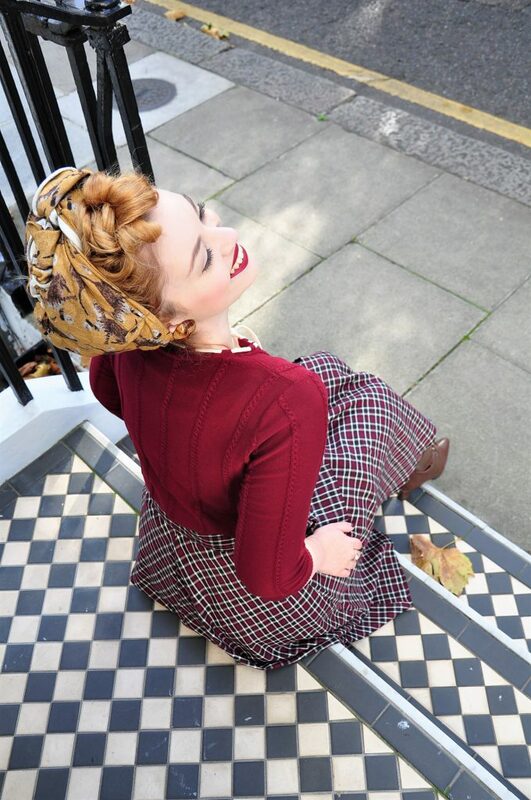 Is there anything better than a swinging tartan skirt for autumn? 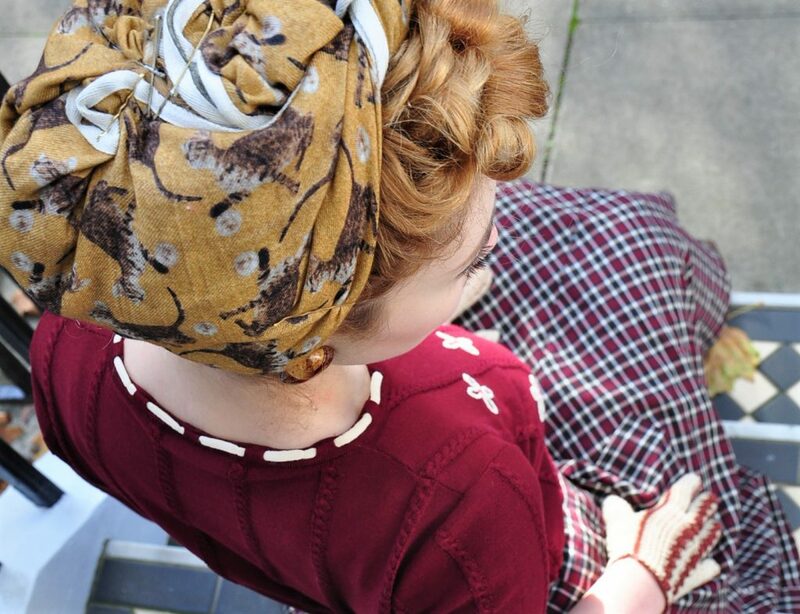 By the way, headscarves are always my personal tip in terms of a quick, easy, long-lasting and convenient hairstyle. The front part of my hair is simply pinned like Pin Curls or a Poodle, just like I show you in my post about 1950s styling. The back part only needs to be pinned close to the head, as it is hidden by the scarf anyway. 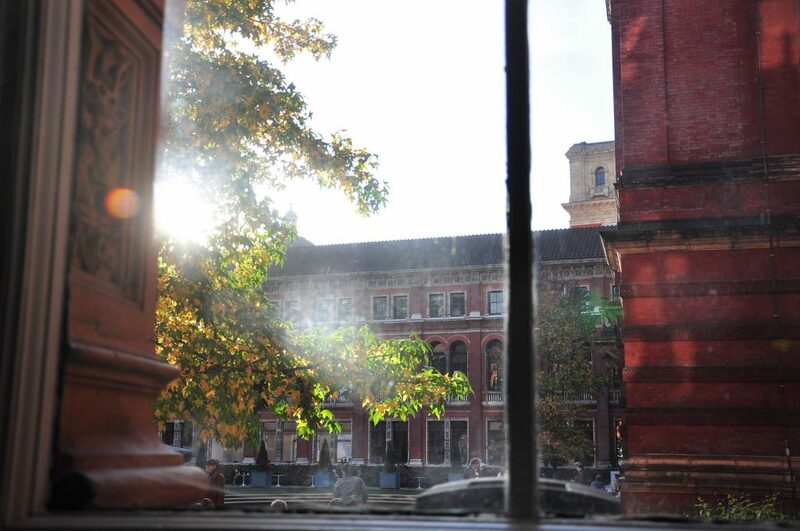 So now that we analyzed the lovely look, let’s get back to culture and discover London’s V&A! London’s V&A became the world’s greatest museum of art and design! The collections continued to grow in the 20th and 21st century. Today’s highlights include the Medieval Renaissance galleries containing some of the greatest surviving treasures, the impressive jewellery gallery and the stunning British galleries. It is those British galleries where I also spent most of my day at the museum. They are illustrating the history of Britain through the nation’s art and design. From the café the visitor can step into the gardens of the museum. The Victorian Era as well as the Arts and Crafts movement in particular were subjects that always caught my interest, in my history of arts studies as well as in my uni seminars about British History. So after my first time at the museum in 2013, where I mostly visited the jewellery and fashion exhibitions, it was now a wonderful opportunity to have a closer look at the British sections. The Arts and Crafts movement was an international movement in the decorative and fine arts that began in Britain between 1880 and 1920. Artists of the Arts and Crafts movement were dissatisfied with the type and quality of the mass-produced furnishing and designs they found in shops. The movement stood for traditional craftsmanship using simple forms, and often used medieval, romantic, or folk styles of decoration. It advocated an economic and social reform and was essentially anti-industrial. It was inspired by the ideas of architect Augustus Pugin, writer John Ruskin, and designer William Morris. It was John Ruskin’s book, „The Stones of Venice“, wherein he illuminated the importance Arts and Crafts in contrary to 19th century industrialization. Beautiful Morris Wallpapers at the V&A,the one above is from 1876. On the left you see pencil notes made by the artist. William Morris (1834–1896), an important figure in late 19th century design, was the main influencer on the Arts and Crafts movement and one of the most important thinkers of the 19th century. Next to his art, Morris was also a poet, author and politician. 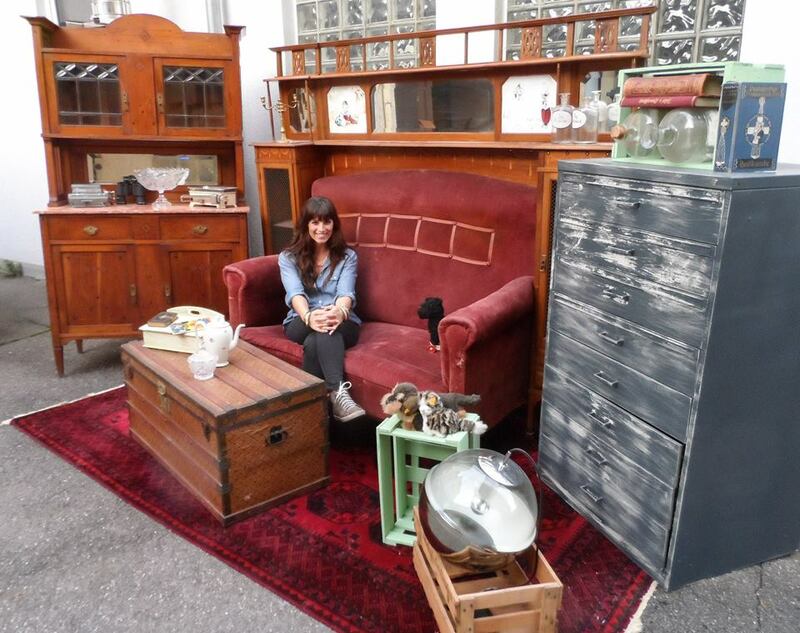 He experimented with various crafts and designing interior and furniture. He was working in manufacture as well as in design – which was one of the key points to the artists’ movement. According to John Ruskin’s theories, the separation of the intellectual act of design from the manual act of physical creation was both socially and aesthetically damaging. Instead, the Arts and Crafts artists believed that makers should derive satisfaction from their craftsmanship. Tip: One of the V&A tearooms were also designed by William Morris, inspired by the Middle Ages. Don’t miss this one on your tour to the museum! 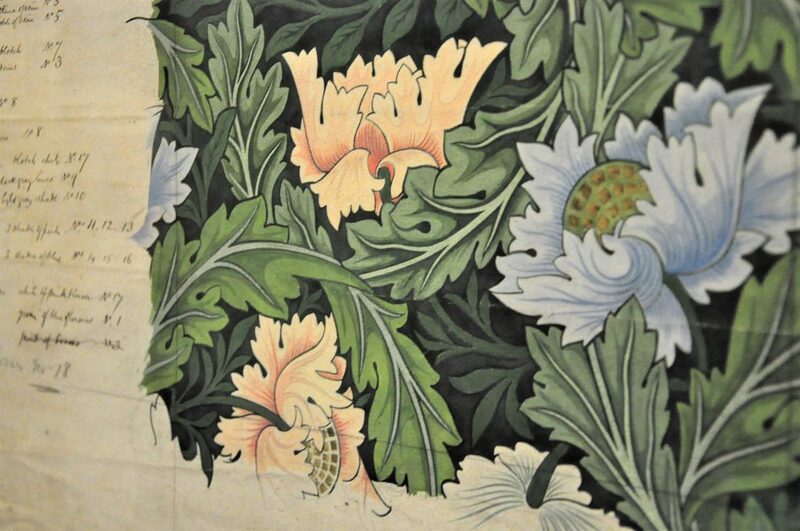 William Morris‘ works included medieval themes, Persian designs, the influence of old Iceland tapestries, fairy tale subjects or the beauty of nature. He paid attention to every detail. What I love most about his works were the wall patterns he created, inspired by flora and fauna, especially the British countryside, with the use of strong colours. Tiles were the least expensive of all the Morris company’s products. They had a variety of use in fireplaces, furniture and on walls. This one was made about 1862. 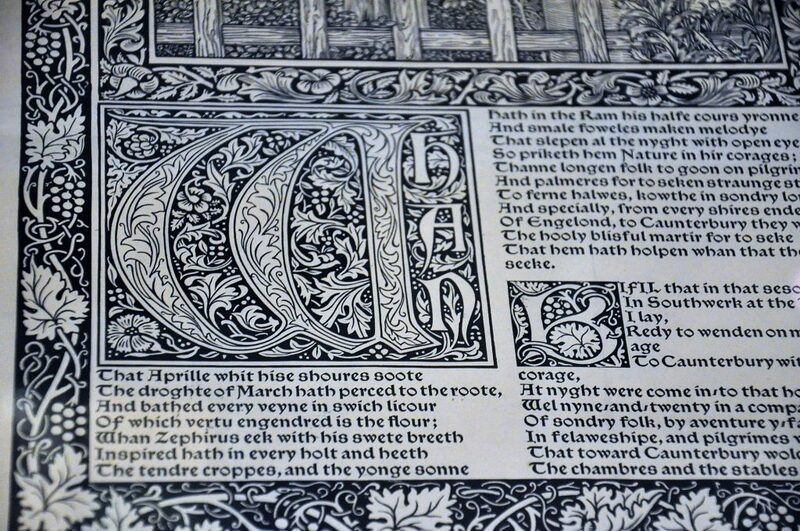 Below you see Morris‘ design for the initial „W“, created for „The Works of Geoffrey Chaucer“ about 1896. One can clearly see the inspiration from medieval lettering. That is why I was truly touched when walking around a corner of the exhibition rooms and seeing some originals of his amazing hand printed wall papers, which you can see in my photographs. These papers, such as the one above with his notes on the side, were printed with the help of blocks. Often about 30 differently coloured blocks were used, until one pattern was finished. This could take about one month. Some of the original blocks are still being used today. 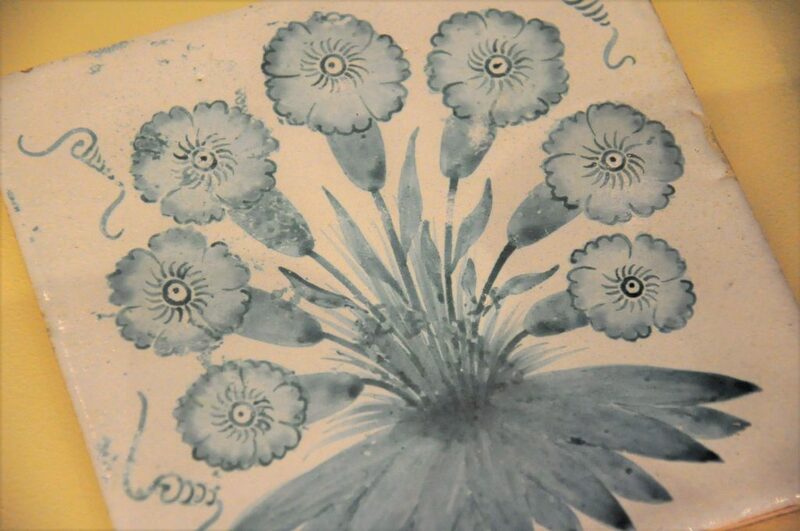 There was a wonderful video in the museum showing how such a wallpaper is being created. 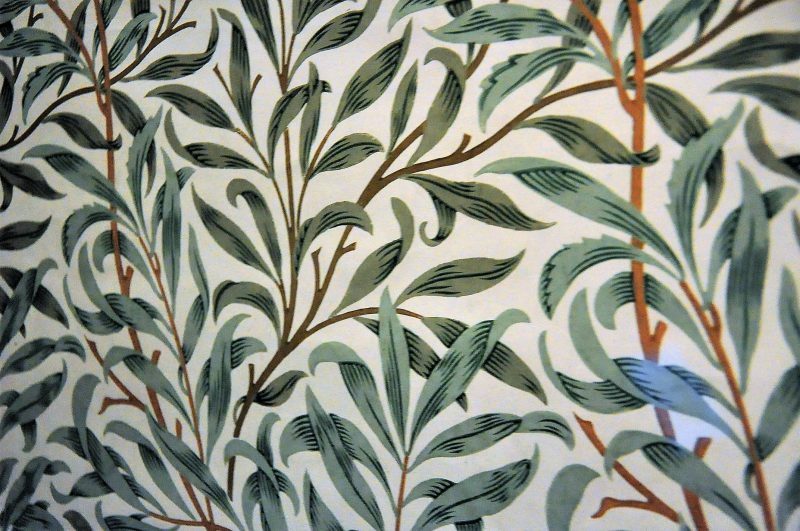 So if one has enough pocket money, then he or she could have his own Morris wallpaper at home! The area where objects of the lives and periods of Queen Victoria and her husband are displayed are as well really fascinating to visit. How amazing to stand in front of an object and knowing this was used by the famous and popular Queen herself! Victoria (1819-1901) was Queen of the United Kingdom of Great Britain and Ireland (1837–1901) as well as Empress of India (1876–1901). She was the last of the House of Hanover and gave her name to the era of the Victorian Age. The British tradition of wearing white wedding dresses was established in the 19th century. 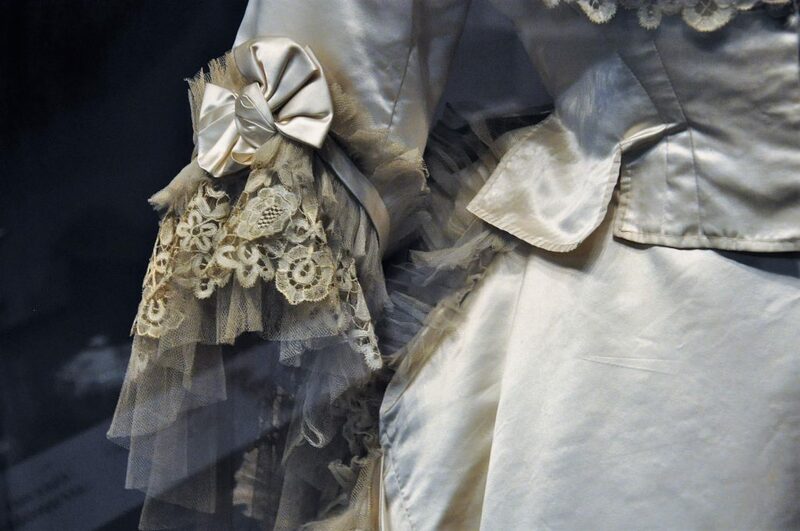 Queen Victoria and her daughter-in-law Princess Alexandra gave royal endorsement to the fashion by getting married in white dresses embellished with British Honiton-Lace. 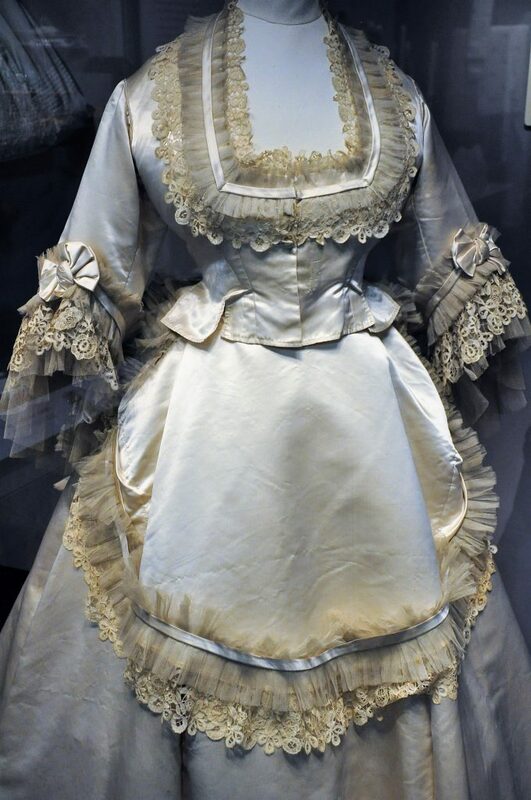 This silk satin dress was made in London, about 1870. In 1840 she married the German Prince Albert of Saxe-Coburg and Gotha. They were a very religious, conservative and family-focussed couple, which was typical for the Victorian era. Together they had four sons and five daughters, through whose marriages were descended many of the royal families of Europe. That is one reason why most of the royal families nowadays still have German roots. Victoria’s 63-year reign once was the longest of any female monarch in history. Her great-great-granddaugther, England’s current Queen Elizabeth II, surpassed Victoria’s record in September 2015. With her husband she worked in closest harmony. After his early death in 1861, so 40 (!) years before her own, she went into lengthy seclusion. The long decades of mourn are also the reason why most portraits show her in black garments. 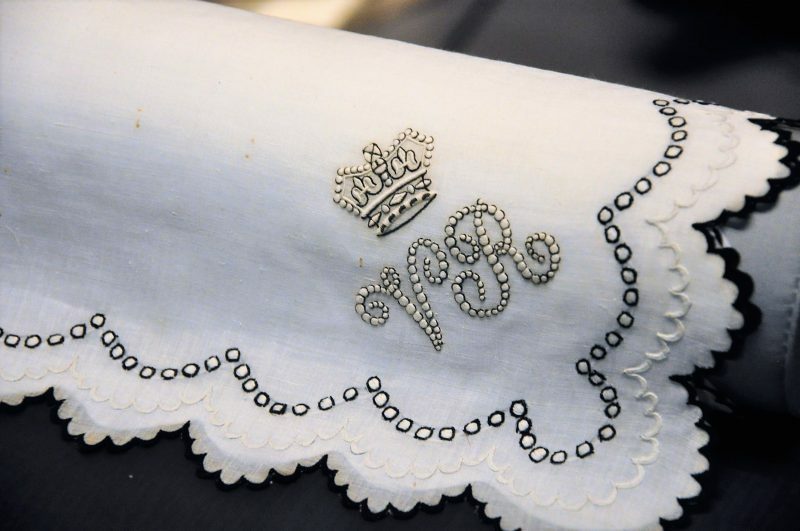 Queen Victoria popularised the use of special mourning handkerchiefs. This one was one of the many she used after the death of Prince Albert. Widows used either black handkerchiefs or white ones edged with black. London’s V&A shows a lovely video in the exhibition, with rare scenes of her life. I found it on Youtube as well, so have a look and see Queen Victoria in action! She died on Isle of Wight and was succeeded by her son as Edward VII. The Victorian Age was a time of incredible industrial change and new forms of technology, advances in science (just like Darwin’s theory of evolution), and communications (the telegraph or popular press). Not to forget the building of the railways and the London Underground, engineering innovations, a greatly expanded Empire, but also unequal growth of wealth, class differences and tremendous poverty. Don’t miss the Cast Courts! One place I definitely need to show you at the end is the probably most spectacular area of the museum – the Cast Courts. Only one of many beautiful reproductions. On this photo you can also see the lovely neckline of the Topvintage top. These two large halls – 24 metres in height – display reproductions (I know this sounds quite unusual) of the most famous sculptures and even columns in the world, such as Michelangelo’s David, Trajan’s Column or bronzes by Donatello. The advantage of these casts is, that nowadays many of them are even better conserved than the originals. You can find more about the impressive casts on the website of the museum. These are just very small parts of the huge varieties of objects that London’s V&A has to offer. If you are going to visit it, you should plan what sections you would like to see and choose wisely. Because one day is not enough for the V&A, neither two or three. It is a place where I could spend weeks and weeks! Did you ever visit London’s V&A or are you planning to? A thanks to Topvintage for the support.